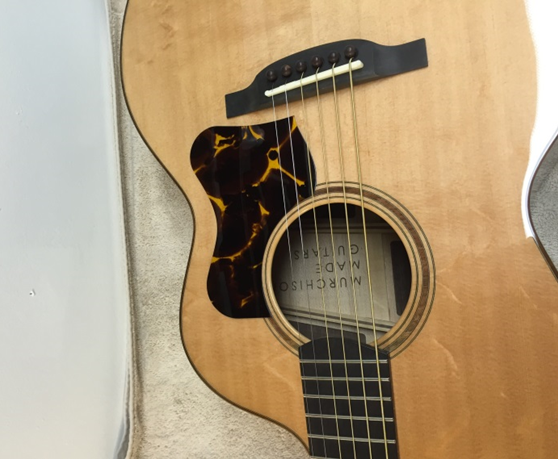 Murchison Made Guitars in New Prague, Minnesota uses RhinoCAM® to assist in the product of The Murchison, a 4th generation acoustic guitar design. 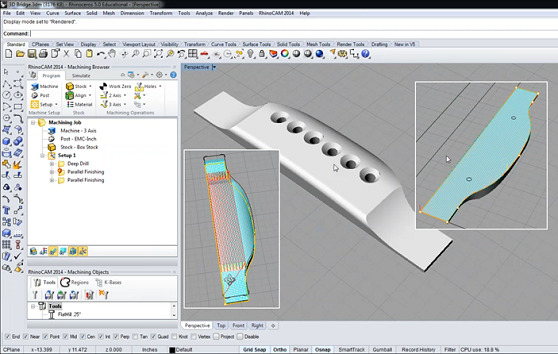 In the bridge design (shown in Figure 1 above), holes for positioning pins are first drilled into the bottom using a 2½ axis Deep Drill operation. In the same setup, a 25 foot radius is machined over the holes using a 3 axis Parallel Finishing operation. The part is then manually turned over and positioned on a fixture where the top also receives the same 25 foot radius. The final product is shown in Figure 2. For more information about RhinoCAM® and other CAD, CAM and 3DPRINT solutions offered by MecSoft Corporation, you can visit their website at https://www.mecsoft.com. If you are interested in learning more about Murchison Made Guitars, LLC, and The Murchison acoustic guitar you can visit them on facebook. Check out our latest case study featuring Murchison Made Guitars on our case studies page.